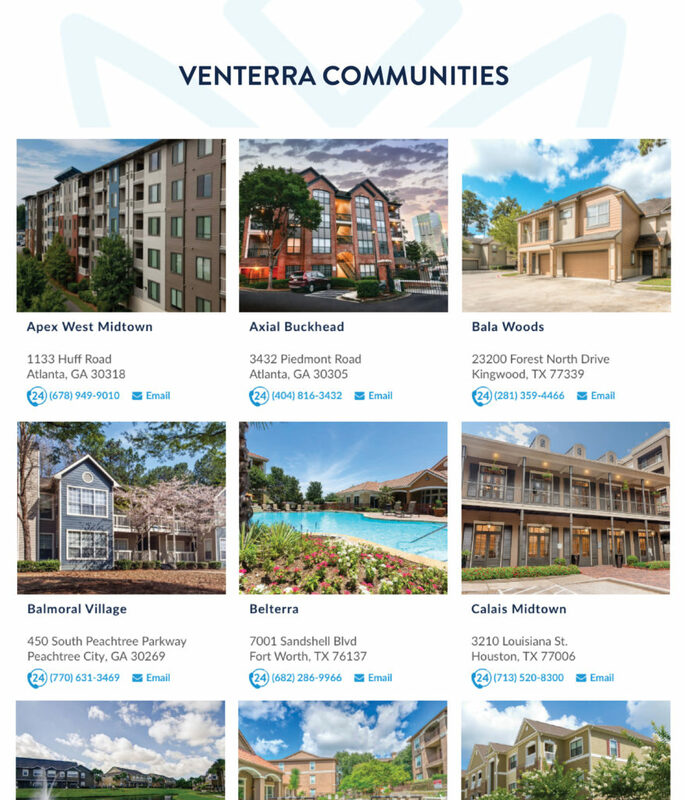 Venterra Realty is a well-capitalized, privately held company. We operate, own, and build technology for our portfolio of well located, Class ‘A’, institutional quality apartment real estate. We identify and acquire our assets in high growth markets in select U.S. cities that are demonstrating sustainable growth. Once acquired, we apply our proven combination of leading technology and operating platform excellence to directly manage the properties, thereby delivering steady quarterly yield and alpha returns to our investors. Deep senior management team that draws from long real estate experience and diverse experience from other industries, leading to industry leading introductions of best practices from manufacturing, distribution and technology fields. All aspects of company operations from acquisition to property operations to accounting and finance are staffed by our world-class team of Venterra employees. Deals done only when we find exceptional value. We do not have the pressure to deploy capital from a fund and we are profitable from ongoing operations. All due diligence done in house (engineering, physical inspection, numerical analysis, etc.). We will be operating the asset upon acquisition, and we want to know first-hand everything about it. Choose assets that yield solid quarterly cash-on-cash from day one. Our assets do not rely on large capital gains to achieve their investment goals. Centralize Automate Liberate. Locate all complex processes in centers of excellence, then apply rigorous automation to increase speed, reduce costs and exercise real-time operating control. This approach then allows our people on site to focus on the customer experience. Venterra is the industry leading Customer/Employee Experience Innovator. Roundtrip investments (bought, operated, sold) during 17-year history: 17.5% IRR average (ie. annualized returns). Historic outperformance over S&P 500 over 17-year history: 760 bps. Consistently outperformed top 10 US REITS in revenue and profit growth.